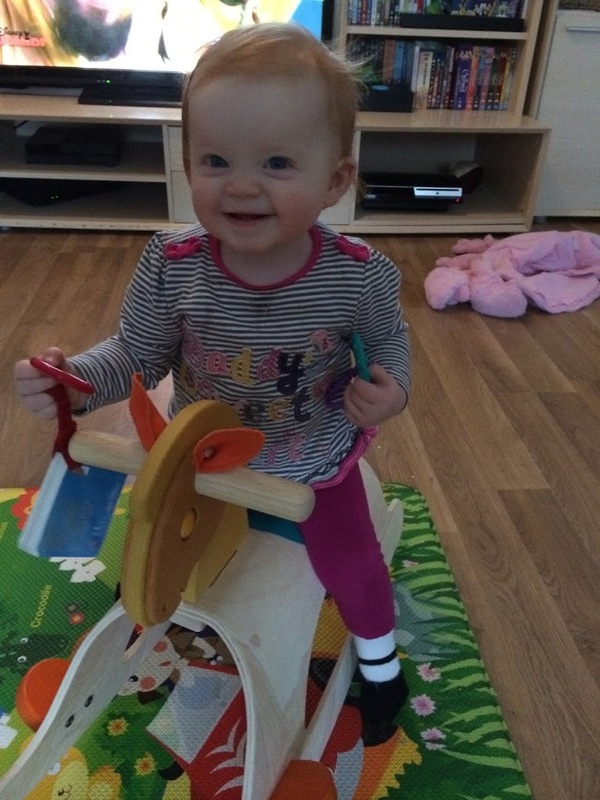 A rocking horse is something you see in every nursery on the television. It’s like a stable toy in your childhood and I wanted Aria to have one. I don’t have the room for a big horse, plus she’s too little. A small, well made, safe and great looking rocking horse was what was needed and Plan Toys have just the Rocking Pony I wanted. I love this Rocking Pony, it’s made from a natural rubber wood and looks and feels amazing. It’s well made, sturdy and robust. Definitely a family heirloom type toy that can be passed on to the Grandchildren. Plan toys specialise in designing and manufacturing environmentally friendly toys, to help teach about the importance of sustainability. I love the design and feel of this horse. It is so easy to put together, I had to screw in a few bolts and put on the feet. The Allen key comes supplied and takes a few minutes. The toy is very great quality and is a classic that will never date. Aria had so much fun on it the minute it was built, rocking back and forth with a big smile on her face. The rocking is very gentle and doesn’t tip over easily. It’s not heavy to move around and doesn’t mark the floor or make a noise when it is rocking. The Plan Toys Rocking Pony has been made to a high standard and a lot of thought has went into it. There are no rough edges and the handles are chunky for little hands. Aria loved the eye ball that moves around to give the pony different expressions. Aria love this Rocking Pony and so do we. It has been played with again and again, even though it’s only been here for a few weeks, it’s became a favourite toy. Tyler can be found on it sometimes. I’ve even seen Aria giving the pony lots of cuddles and kisses which is so cute. The Rocking Pony by Plan Toys isn’t cheap at £78.95, but it is so well made, looks amazing and safe that it’s worth every penny. I think this is a great toy and one that will never date.